A 13-year partnership between the Kresge Foundation and Inyathelo, the South African Institute for Advancement, helped eight universities and one teaching hospital double, triple, and in some cases, quadruple private fundraising between 2006 and 2019. This week, Kresge Education Program Managing Director Bill Moses met with participants at Inyathelo’s 2019 leadership retreat entitled, “Learning Through Reflection: Advancement for a Sustainable Future.” Moses offered a look back at the impact of the Kresge-Inyathelo Advancement Initiative. 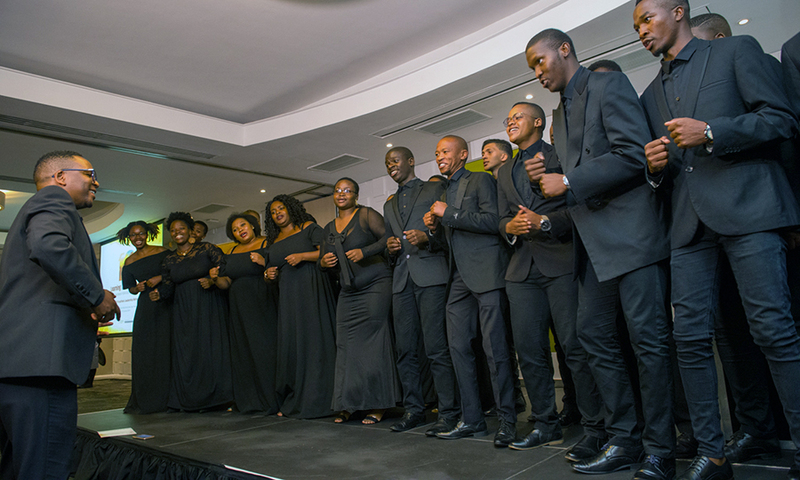 Students from the University of the Western Cape’s Creative Arts Choir perform at the 2019 Inyathelo Leadership Retreat, under the direction of Sibusiso Njeza. Key successes include the University of the Western Cape, which within its first five years of participation in the initiative, raised $41 million to construct an iconic and bustling life-sciences research building. Smaller institutions such as the Durban University of Technology (DUT) have also grown their fundraising capacity. Funds raised by the DUT development office helped the school double the number of need-based grants for students, from 10 in 2017 to 20 in 2018. DUT has also been able to appoint three more fundraising staff members in 2018, increasing capacity to five staff members. Inyathelo seeks to build a more robust philanthropic culture and strengthen fundraising capacity among the nation’s higher education institutions. Private giving has helped many South African universities fund new research initiatives, build essential facilities and provide financial aid to students in need. Kresge Education Program Managing Director Bill Moses (center) with Dianne Parker, South Africa's Deputy Director-General: University Education (left), and Nazeema Mohamed, new executive director of Inyathelo (right). This week’s retreat participants included more than 60 college leaders, representatives from the Department of Higher Education and Training, and Africa-based philanthropic leaders. The event comes at a critical moment for Inyathelo, which recently named Nazeema Mohamed as its newest executive director. Mohamed previously served as the director of policy development and support in South Africa’s Department of Education and, more recently, as a program officer at the Ford Foundation. The retreat also comes as the 13-year partnership between Inyathelo and Kresge nears its completion. Kresge’s grantmaking supported advancement training and capital projects, and totaled $22.4 million. In recent years, Inyathelo has secured grants from national and international foundations to support its ongoing work. “Inyathelo has become a critical thought leader and convener within the South African higher education landscape,” said Moses. “We’re confident Ms. Mohamed will continue with its very best traditions,” said Moses.